Editors Note: There are photos associated with this press release. 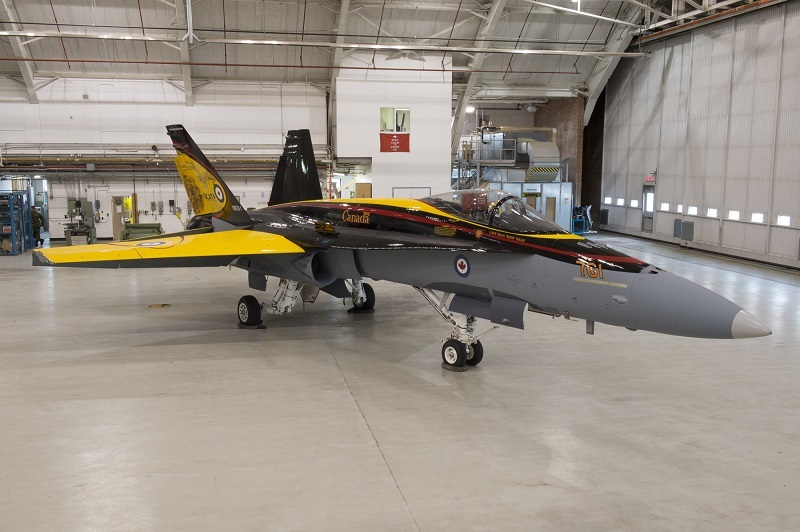 The Royal Canadian Air Force (RCAF) is proud to unveil today the CF-18 Demonstration Jet for its 2016 season. The unveiling ceremony took place at 4 Wing Cold, Alberta, where the jet was painted over the past few weeks and was attended by the Wing Commander, officials from the City of Cold Lake and the Town of Bonnyville, and Capt Ryan Kean who will have the honour to fly the jet. It provided all in attendance a chance to see for the first time the CF-18 Demo Jet design commemorating this year's theme, the British Commonwealth Air Training Plan. In 2016, the Royal Canadian Air Force is commemorating one of the world's greatest air training programs, the British Commonwealth Air Training Plan (BCATP), which ran from 1939 to 1945, and the 75th anniversary of the establishment of RCAF's 400-series squadrons which makes up the fabric of the modern RCAF. These squadrons, which continue to serve Canada and Canadians to this day, came into being as a result of Article XV of the BCATP agreement. By the end of the Second World War, the BCATP had produced 131,553 aircrew, including pilots, wireless operators, air gunners, and navigators for the Air Forces of Great Britain, Australia, New Zealand and Canada. The plan also trained citizens of other nations - including Poland, the United States, Norway, Belgium, the Netherlands, Czechoslovakia and France that were critical to the war effort. Further, tens-of-thousands of maintainers and support staff were recruited and trained by the RCAF to support the effort - without the contribution of these civilian men and women, the plan would have failed. A native of London, Ontario, Captain Ryan Kean joined the Canadian Armed Forces in 2003 under the Regular Officer Training Plan. In July 2013, Captain Kean was posted to his current unit, 410 Tactical Fighter (Operational Training) "Cougar" Squadron, as an instructor pilot on the CF-18 and is currently the Squadrons Deputy Operations Officer. During his time at 4 Wing Cold Lake, Captain Kean has participated in multiple training missions and exercises all over Canada and the United States. He has also conducted operational missions both at home and overseas in support of NORAD and NATO missions. He has over 1,600 flying hours on high performance military aircraft, including 1,300 hours on the CF-18 Hornet. 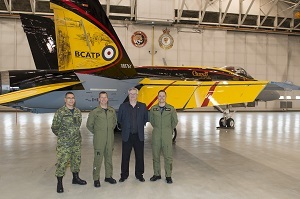 The specially painted CF-18 Hornet features a unique commemorative paint job designed by veteran design director, Jim Belliveau, at 4 Wing Cold Lake, Alberta. "I am honored to be representing the Royal Canadian Air Force during this year's airshow season. I hope to be a source of inspiration to our young Canadians the same way I was inspired myself as a young child. I am looking forward to sharing with them my passion for aviation, hoping to motivate them to reach for their dreams as I did when I decided to become a fighter pilot. This year's theme also fits well with the Demonstration team outreach mission as it ties together a pivotal moment in our Air Force's history and its long standing relationship with our communities across Canada." 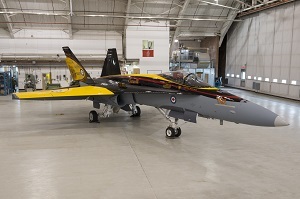 "It is always a privilege for 4 Wing to be entrusted with the responsibility to design and prepare the Demonstration CF-18 which allows the Royal Canadian Air Force to connect with thousands of Canadians and present them with proud moments of our heritage. This year again, Mr. Jim Belliveau has demonstrated incredible talent in capturing an idea as complex as the British Commonwealth Air Training Program. Mr Belliveau and our technicians outdid themselves bringing to life Jim's idea. This jet will be for all to enjoy because of the hard work and commitment of our 4 Wing members."